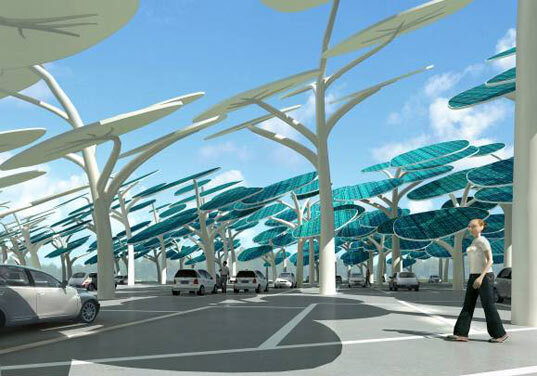 Inhabitat has a post on solar parking lots - Solar Forest Charging System for Parking Lots. Although electric vehicle use is on the rise, we’re certainly not out of the woods yet in terms of providing them with a steady supply of clean energy - that’s why designer Neville Mars has conceived of an incredible EV charging station that takes the form of an evergreen glade of solar trees. His photovoltaic grove serves a dual function, acting as a go-to source for clean renewable energy while providing a shady spot for cars to park as they charge. Each of the trees in Neville Mars’s solar forest is composed of a set of photovoltaic leaves mounted on an elegantly branching pole. The base of each trunk features an power outlet that can be used to juice up your eco ride as you run errands. Neville told Inhabitat that the tree and leaf design wasn’t a goal but came naturally as they tried to maximize the shaded surface that the structures provide. Although the efficiency of overlapping photovoltaic panels initially raised some concerns, Neville went on to explain that the leaves rotate with the sun to ensure maximum efficiency. The solar forest is certainly an aesthetic step up from your standard sun-baked concrete parking lot, and serves as great inspiration for integrating solar technology with natural forms. Another fun project to do in Photoshop. Not a fun project in the real world. IMHO. PV panels aren't currently manufactured 'in the round'. There's likely to be a significant cost factor in producing panels for these "leaves". The big pods are going to move? More cost for moving parts, more stuff to require service and break. I'm not sure driving through this forest is going to be nearly as pleasant as driving through a real forest. This one presents some very abrupt transitions from shade to full sun, unlike trees. Think strobe light effects. Why not design for the real world? Use least costly methods and materials and put them together in attractive packages? Grid intertied, energy producing, plug-in offering, shade giving parking lot covers are a wonderful idea. Now who can produce the most attractive, least "looking like a carport" design? Oh yeah, the design should allow people to walk to/from their cars in the shade and protected from rain, snow, icy walkways. 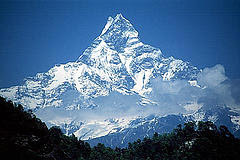 And they should be easy to clean (including snow) and easy to adjust a few times a year for optimal solar angle. Is that too much to ask of the creatives ? THE GREEN DEAL PROJECT(www.TheGreenDeal.50webs.com) WOULD LIKE TO COMPLIMENT THIS APPLICATION OF SOLAR ENERGY.